September is a week from over and I haven't written a single blog post all month. I've been writing, generally sticking to six days a week and have finally had a break through about how to structure my novel-- too bad that it has come 40 000 words in to the first draft! For those writers among you, I'm sure you know the excitement that comes with finally thinking of a way to pull all those errant words together. And yes, I'm sure you know that those moments usually happen while you're in the shower, driving, or almost asleep and therefore unable to stop and write everything down right away. 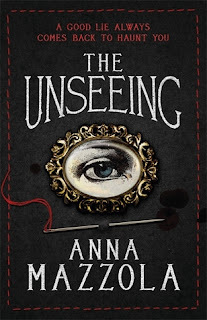 Anna Mazzola has a new book out this year, and I first came across her on Twitter when someone I follow retweeted her. I had the funniest feeling that I knew the name from somewhere, but looking at the blurb of her first book, decided that I definitely had not already read it. But I wanted to, and so I requested it from the library. It's sort of a Burial Rites type of plot, but set in 1830s England and has all sort of lovely gothic Jack the Ripper, bodysnatching vibes. I am enjoying it very much so far and I am looking forward to Anna Mazzola's new book, The Story Keeper. The Unseeing is told from two points of view, that of Edmund Fleetwood, a lawyer who seems to have more of a moral compass than most of his profession, and Sarah Gale, imprisoned at Newgate for her role in a horrific murder where a young woman was dismembered and her body parts scattered around the city. The atmosphere in this book is just perfect and I can't wait to see where the plot is going because I think more than one character is keeping a secret! I love Kate Morton. I love every single book of hers. I practically ran down to my local bookshop on the day that this one came out and planned to spend that whole night reading but... homework etc. Instead, I read it this week while I had the house to myself and read the whole thing in just under three days. It's different to what I expected, but in a very good way. 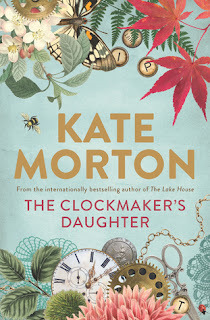 Kate Morton's books usually have two timelines which plait together to reveal a secret from the past, where someone in the future is shedding light on something that happened long ago, and that still happens in The Clockmaker's Daughter, except instead of being two timelines, there are about five. Only a really skilled storyteller could make it work. I was left with a few lingering questions that I don't feel got answered, but ultimately, I put the book down with that happy, satisfied glow that comes from reading a transporting novel. Also, how stunning is the Australian cover? I was mad that the new Kate Morton covers don't match the originals until I saw this. There are a few historical novels on my radar for the future, many of them World War One themed for research into my own novel. I'm also still very interested in the Wars of the Roses although the mania from last month has subsided and I think I will be able to make it safely to the next Philippa Gregory novel... that being said, one of the options for what I might read next is Jane Seymour: The Haunted Queen by Alison Weir, the third in her series about Henry the Eighth's six queens. There's very little in my retinue by way of knowledge about Jane, other than that she was the only wife to give Henry a living son, and that she died not long after. There are some portrayals that suggest she may be the only wife Henry married for love, but I'm not sure if we can ever know that for sure. If anyone can get to the heart of it, though, it's Alison Weir. Another option is the new novel by Paula McLain, Love and Ruin which returns to familiar territory from The Paris Wife, as it follows the story of another of Hemingway's marriage, this time to journalist Martha Gellhorn. I don't know much about it other than that I loved The Paris Wife and I am excited to get stuck in. Finally, I hope to get to Imogen Hermes Gowar's novel The Mermaid and Mrs Hancock very soon... I have had this on my list of things to read since February and the novel has been sitting on my bedside table since March. Not sure why I have put it off! Again set in the 1800s, it is the story of a man who comes across a specimen that is said to be that of a 'mermaid', and I've seen reviews raving about this debut novel all year long in the wake of its being longlisted for the Women's Prize for Fiction. Wow. That's a lot of reading. Interested to know, if you find you are still able to read for pleasure or do you find as a historical novelist yourself that you are always reading for ideas to borrow. Do you find you are drawn to pretty much any book set in a particular period or is it more the story and the author. (personally, I don't think I could ever read another story about Henry VIII no matter how well written) The Mermaid and Mrs Hancock sounds interesting. I hope you post on it soon to let us know if its worth a read. Hi Richard, thanks so much for your comment. I think that idea you bring up is really interesting-- I try to set out reading for pleasure but there is an element of the magpie in me, looking for techniques I can adapt to my own work. Sometimes I have found solutions to particular plot problems in reading the works of others. I try really hard not to out and out copy though... I hope I manage not to copy inadvertently. For me, I'm really drawn to novels about certain periods but those do change all the time. I always love a good World War Two story, and lately I've been interested in World War One, the Victorian period, and the Wars of the Roses. Funny you should mention your aversion to Henry VIII as I also love books set in the Tudor court! I will definitely try to put up a review of The Mermaid and Mrs Hancock soon.